A new study has just been published by VISICORT researchers in the leading open access journal Frontiers in Immunology today, 20 November 2018. 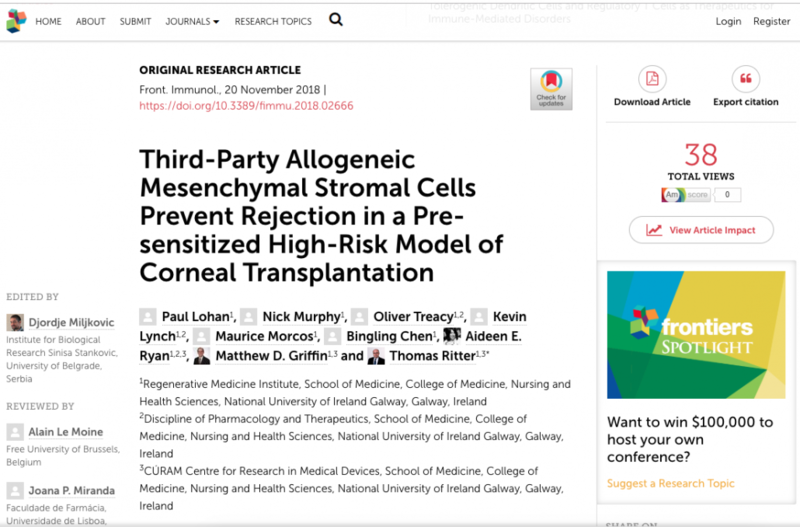 The study “Third-party allogeneic mesenchymal stromal cells prevent rejection in a pre-sensitized high-risk model of corneal transplantation” was completed by the National University of Ireland Galway team of Paul Lohan, Nick Murphy, Oliver Treacy, Kevin Lynch, Maurice Morcos, Bingling Chen, Aideen E. Ryan, Matthew D. Griffin and Thomas Ritter. The study shows for the first time that intravenous administration of third-party allogeneic mesenchymal stromal cells (MSC from neither the new cornea recipient nor the cornea donor) results in distinct immune modulatory effects that overcome pre-existing anti-donor immunity to prolong rejection-free survival of corneal allografts in a laboratory model of high-risk corneal transplantation. The experimental cell therapy regimen described in the paper appears to be compatible with prior cryo-preservation and with co-administration of a relevant immunosuppressive drug. These findings open the door to clinical translation of “off-the-shelf” allogeneic MSC products for recipients of high-risk corneal transplants who continue to suffer from very poor long-term graft survival rates. The results of this experimental study have formed the basis of a regulatory submission for the VISICORT Phase Ib clinical trial in patients receiving a second or greater transplant who are at high risk of rejection. This trial will determine the safety and feasibility of co-administration of allogeneic MSC and MMF in the setting of high-risk corneal transplantation.